We are totally stoked to announce the 5.0.0-beta1 release, another major milestone on our road to Beats 5.0. IMPORTANT: This is a beta release and it is intended for testing purposes only. Metricbeat is a new addition to the Beats lineup for the 5.0 release. It’s a lightweight shipper that periodically interrogates external services, and sends their metrics to Elasticsearch. Metricbeat is replacing Topbeat in the 5.0 release, and it incorporates all the metrics provided by Topbeat plus many more. In this release, PostgreSQL and HAProxy are added to the list of supported Metricbeat modules. The PostgreSQL module exports statistics about each PostgreSQL database, the background writer process activity, and each PostgreSQL process. Thanks to a community contribution by @hartfordfive, Metricbeat is able to collect statistics from HAProxy, an open source TCP/HTTP load balancer. To enable gathering the statistics from HAProxy, you must enable the stats socket via TCP. For more details please check the documentation. Metricbeat is able to collect control group metrics from the Linux kernel. Control groups, which are commonly referred to as cgroups, is a mechanism for allocating resources - such as cpu time, memory, or block I/O time - to a process or set of processes. Cgroup metrics are especially useful for collecting detailed metrics from processes running inside containers because each container is assigned to a cgroup. The benefit of collecting container metrics directly from cgroups is that it works with any container tool (e.g. Docker, rkt, runC, LXC, systemd). Metricbeat reads directly from the cgroup pseudo filesystem provided by the Linux kernel, so it has no dependency on the APIs provided by the container tools. For more details about how to enable cgroups functionality in Metricbeat, please check the dedicated blog post. Please note that cgroups is experimental in 5.0.0-beta1, and it’s disabled by default. Starting with the 5.0.0-beta1 release, each Beat package comes with an app, called import_dashboards, which replaces the bash/powershell scripts to import the Kibana dashboards. The reason behind this change is to make it easier for us to maintain a single Golang application instead of two scripts, and for the user to easily import any Kibana dashboards by running a single command. To keep the Beat package light, starting with the 5.0.0-beta1 release, we are releasing the sample Kibana dashboards for all the Elastic Beats in a separate common package, instead of including the dashboards in each Beat package. The import_dashboards app accepts a URL to any local or online zip archive that contains the Kibana dashboards. If no URL is provided, by default the app imports the Elastic Beat dashboards of the same version as the Beat package. You can now make use of any Kibana dashboards created by the community, by passing the URL to a zip archive that contains the dashboards, visualizations, and searches. 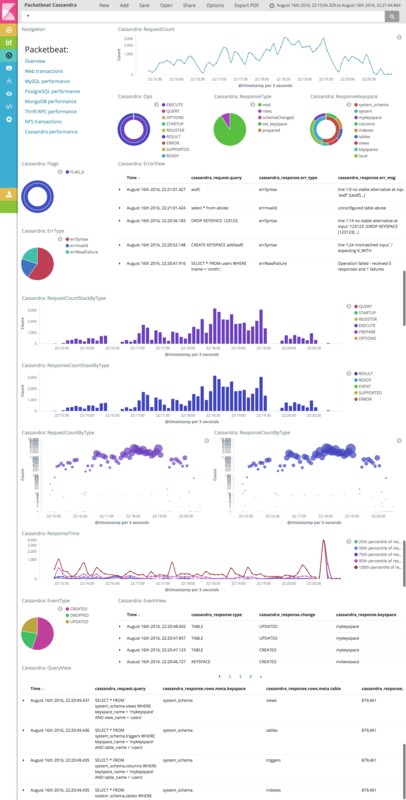 Do you have some awesome Kibana dashboards to share with the community? Build your own Kibana dashboards, upload the archive to your GitHub repository, and share it with the community by creating a topic in the Beats forum. In 5.0.0-beta1 the Kafka output received many more enhancements since first introducing Kafka support for 5.0.0-alpha releases. The Kafka Go client library Sarama by Shopify has been upgraded to version 1.10.0, adding support for Kafka 0.10. In addition to 0.10 support, SASL/plain authentication support has been added, so you can configure the username and password used to connect to Kafka. The beta1 release enables users to configure the topic selection and event partitioning strategy. You can choose between `random` event distribution, `round robin` event distribution, or `hash`-ing, where a hash-value is computed either from the event key or a composed hash value based on configurable event fields. Check the documentation for more configuration details. Starting with the 5.0.0-beta1 release, you can monitor the network traffic exchanged between your applications and Cassandra. A sample Kibana dashboard for Cassandra is available, and you can import it together with the other Packetbeat dashboards by using the `scripts/import_dashboards` or `scripts/import_dashboards.exe` script from the Packetbeat package. This is done as part of a larger effort to align the security settings across all the Elastic products. Changing TLS to SSL in all output types breaks the compatibility with the older versions. To make it easier for the users to upgrade their configuration file, we provide a python migration script, which you can find in the “scripts” folder of the Beat package. A big Thank You to everyone that has tried the alpha releases and posted issues or provided feedback. We’d like to also remind you that if you post a valid, non-duplicate bug report during the alpha/beta period against any of the Elastic stack projects, you are entitled to a special gift package.